This biennial award is for significant contribution to the practice of the geotechnical profession and the life-blood of the Society. This award complements our other awards, and particularly the E.H. Davis Memorial Lecture. 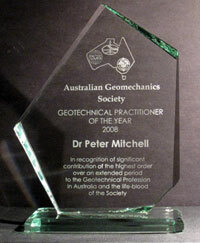 The award recognises contributions of the highest order over an extended period with a commitment to the geotechnical profession in Australia and the Australian Geomechanics Society. Nominations should be made by at least three persons (not necessarily members) to the Secretary of the National Committee of the Society following a call for submissions in Australian Geomechanics . Nominations must be accompanied by a comprehensive supporting document. The award is to be made bi-annually and is presented by the National Chairman or his/her representative at a mutually convenient time and venue. The award winner will present a paper to a technical meeting of the Society. The award includes a glass memento.